Our press is located in Lawrence, Kansas. The university town has long been a regional center for independent, free-thinking. Before Kansas was a state, Lawrence was ground zero for the abolitionist movement in the territory. After statehood, when a pack of guerilla bandits crossed the border from Missouri and burned most of the town to ashes, Lawrence dusted itself off, and got back to living its independent life. We are proud to be supported by two outstanding independent bookstores. 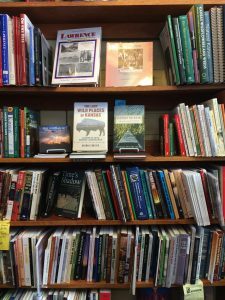 The Raven Bookstore and the KU Bookstore are vastly different operations, but share a common vision of supporting authors, readers and a fierce passion for getting the job done their way. The Raven sits on a side street just off Massachusetts Street in downtown Lawrence. If you close your eyes and picture a quaint bookstore, chances are you’ll imagine The Raven. Old wood floors creak with each step and the store is full, floor-to-ceiling, with books. 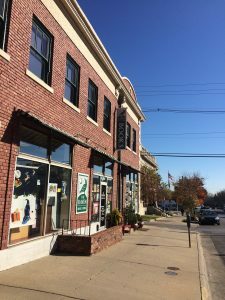 The shop has a reputation for stocking the best mystery novels available, but also carries a full line of non-fiction, best-seller, children and regional books. Heidi Raak has operated The Raven Bookstore for 9 years (the store has been a staple for Lawrence readers since 1987). An independent store since its inception, Raak has weathered (and continues to weather) the changes in the marketplace. Raak works hard to create an environment around the store that keeps people interested. The Raven hosts countless book launches, readings and parties with authors. Those events bring people to the store and help establish the staff as go-to resources. Up the hill from The Raven, on the north edge of the University of Kansas campus, the KU Bookstore fills most of the 2nd floor of the Kansas Union. 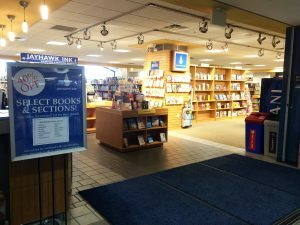 The store is one of only a handful of bookstores serving a major university that operate independent of the university. The great majority of university bookstores are operated by a larger, national bookstore. When asked to name other independent stores serving universities, O’Connor struggles to name more than two or three. Much like The Raven, the KU Bookstore puts a lot of effort into bringing students, and the Lawrence community, into the store with events. O’Connor estimates they host one or two unique events a week either at the store or somewhere on campus. Because the store is a non-profit, they can often offer very competitive prices on trade, text and consumer books. In fact, almost half of the store’s sales are books or products not for a class. “An Ode to the Independents” is our contribution to University Press Week blog tour. Be sure to check out posts by the University of Texas Press, the University of Chicago Press, Cornell University Press, University Press of Colorado, NYU Press and our friends at the University Press of Kentucky.